Poker is a game that involves more strategy than luck and if you really want to better your game and win big then you need to know many intricate strategies of play. 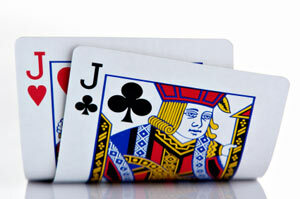 Pairs are weapons in the game of poker and if played rightly can be very beneficial to your standing in the game. Playing with pocket pairs is also one of the most troublesome areas for players as the decisions they make with these cards can often prove to be the turning point of their entire game. What we are going to talk about in this Bitesize Strategy article is middle pocket pairs, which are basically pairs from pocket 8’s to pocket Jacks. The most crucial time for middle pocket pairs is before the flop. At this point players are unsure whether they should raise, fold or simply call with their pocket pair. This is where strategy comes in and by gaining knowledge about this, players are able to make smart decisions with their cards and stay in control. Just making a call before the flop can catch opponents unaware and gives little away to them about the hand you are holding. By doing so you are both limiting your exposure to the hand (by committing less to the pot) and also masking the potential strength of your hand. The opposite side of this is that it allows your opponents into the hand cheap with what maybe a weaker hand than yours and gives them the opportunity to overtake you by hitting on the flop. By simply calling before the flop, this gives you the opportunity to re-assess the situation after the flop has been dealt – if the cards delivered on the flop are dangerous and include one or two Overcards and you feel your middle pocket pair is no good then you can get away from the hand cheaply and avoid committing any more money into the pot. It also retains a lot of potential in your hand, by disguising the strength of your hand and making it a sleeping giant, so this way if you hit a big hand on the flop by catching trips then you may be able to get a better payout. Calling before the flop is good in games where raising doesn’t really limit the field, where your opponents are consistently calling raises. Remember that your call keeps the pot small and controllable, so see how that works for you and use it to your advantage. Throw away your middle pocket pairs when you feel that your opponent has a higher pocket pair. I know this is obvious but do this before the flop or you will end up paying heavily. Sometimes you may get it wrong and discard your pairs for nothing, but it is better to be safe than sorry, and middle pocket pairs can be the cause of many a big loss if you are not careful. Go with your instincts on this one when the play indicates a higher hand in play and you are confident in your read then dump the cards – they can’t hurt your bankroll in the muck. Raises before the flop can work well with middle pocket pairs; however this does not mean that you should make a raise just because you think you have a good pair. It is essential to evaluate the playing field and see if the raise would be beneficial by thinning out the field. The thing about middle pocket pairs, is after the flop you are often faced with difficult decisions as more often than not there will be at least one Overcard on the flop and you are always left trying to assess if your opponent has hit that Overcard (or whether he has a higher pocket pair!). The more opponents in the hand, the more likely that one of those opponents will connect with the Overcard(s). So this is where taking control of the hand before the flop, making a raise and thinning the field of players in the pot is beneficial, as it reduces the chances of an opponent hitting an Overcard (due to their being less opponents). The overall thing to remember is that although middle pocket pairs are a good starting hand – they are often beaten by the end of the hand, and it is up to you to control the hand to both minimise your loses when you do lose and maximise your winnings when you hit big with trips or better. I can’t stress this enough, but middle pocket pairs are one of the most dangerous hands for beginners to play, because they look pretty, but can get you into so much trouble and cost so much money if you don’t play them with caution and be aware of the dangers.